When the DNR tested 9,305 deer in 2007, the infection rate was 1.9 percent (135 cases) among 7,192 deer analyzed in the southern farmlands zone. That area’s infection rate in 2017 was 10.6 percent (588 cases) for 5,545 deer tested. * Then there is the skyrocketing rate at which waterways in Wisconsin are being officially declared "impaired," principally through contamination by phosphorous discharges which were greatly deregulated by Walker and the legislature. Not to mention the related problem with waste runoff from large dairy operations which Walker and his appointees continue to expand regardless of the harmful environmental and ruinous economic impacts on smaller farms. Together with Walker's laissez-faire dismissal of strong chronic wasting disease programs, call it Lazy Loose Policy-making 2.0. I'd added up the numbers submitted by the DNR to the US EPA, and found that during Walker's tenure there had been 804 new impaired waterway listings in Wisconsin, compared to 96 waterways removed from the dirty list. Then I noticed that the DNR subsequently added two more impairments, hardening the ratio of newly-impaired waterways to newly-repaired waterways to a solid 8:1. * And speaking of Foxconn, and lazy-loose-'policy-making,' the DNR gave hurried approvals to the company's air pollution permit applications will lead to the release annually of 796 tons of airborne contaminants that can work their way into Southeastern Wisconsin, its waterways, farms, fishing holes, yards, and play pools. And Lake Michigan. And your kids' lungs. And your grandparents cardiovascular systems, your eyes and asthmatic conditions, too. Giving a shoulder shrug to the addition daily of more than two tons of polluting emissions in an area already at or failing current EPA standards for healthy air quality - - let alone GOP efforts to roll back the state's role in clean air guarantees - - is actually more than merely lazy and loose: it's ideologically-driven, intentionally thoughtless and predictably harmful special interest favoritism. And politicians who support these attacks on clean air and water which are at such odds with basic conservation should be stripped of permission to use the label "conservative." Before being replaced in office by citizen-leaders who will put public health before campaign donations and private, subsidized corporate gain. * It's up to you to believe the guarantees given by Foxconn and public officials that none of the 7 million gallons of daily diverted Lake Michigan water the DNR also speedily-approved to be piped to the company - - visualize 1,100 water tanker trucks in a line 14 miles long to get an idea of what the company may or may not have the right to receive - - won't find its way after being utilized in proprietary, heavily-industrialized LCD flat-screen production processes into Lake Michigan. Or where it can soak before seeping out the wetlands, lake beds and streams on the company's massive site which the state, as a unique favor to Foxconn, has exempted from permitting reviews and protections which had been considered routine procedures to guarantee water quality and public health. Here is a link to a complete archive about the Foxconn project. * And I loved this story about efforts to try and save a resilient bur oak hundreds of years old from the Foxconn bulldozers. So multiply that dedication by the tens of thousands and you have a better understand of why Friends of the Black River Forest is trying to stop the bulldozing of somewhere around half a heavily-forested 247-acre nature preserve in Sheboygan, to which Walkerites had hurriedly annexed it to speed along its deforestation. * Next up: metal mining, and its acidic runoff. A Wisconsin whose politics and priorities have been impaired at Walker's direction does not need more impaired waters added to already his already substantial lists. 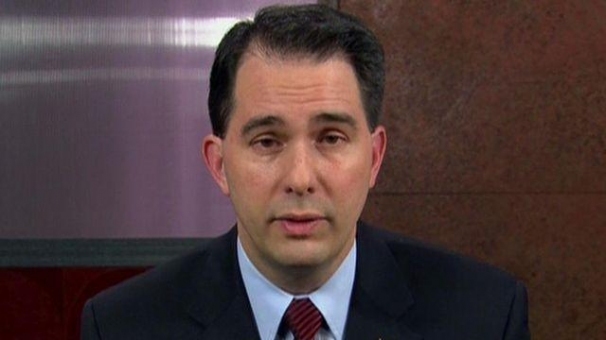 Just pointing out that you're using a doctored photo of Walker--his eyes don't line up and neither do his eyebrows. It's not a doctored photo. Walker's eyes don't actually line up. If you watch Walker's various tv photo ops these past 7+ years, you'll notice it too.